Traditional views and priorities of landscapes have changed. In the past, the most visible impact or first impression of a landscape was the flowers. The second was turf, the squarest footage of any plant material on site, continued so on down the line. As you will see, irrigation is the least visible to the landscape and therefore, typically the least attended to. The below graph indicates landscape sustainability from an investment point of view. Safety is always first; an accident can impact a community for many years down the road. The second is water as we all know living entities, including plants, cannot survive without water. This is the most important component in any landscape. The third through seventh is based on replacement costs. The trees will be the most expensive if same size, same type tree replacement is required. Shrubs, ground cover, turf and flowers follow in the order of cost to replace. RILMP embodies proactive management of your landscape in a sustainable fashion. Your landscape investment can be managed to preserve resources like water, energy, labor, and materials. 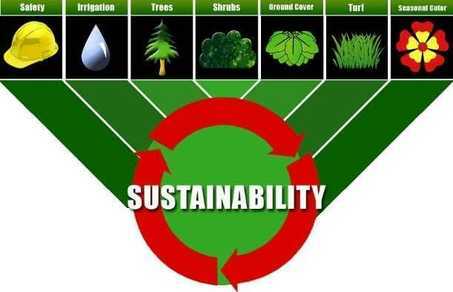 Sustainability considers your property’s horticultural needs as well as hardscape, lighting, and security on the site. Through proactive management of these areas, Rockaway, Inc. can help limit your liability on the site, while sustaining your landscape at the highest standard possible.